Hi all, please advise on what I should do next as I am having doubts to what the help desk suggests. First of all, let me give you some background. My landline had trouble receiving incoming calls couple of months ago, definetly before July. ADSL stayed working during the entire time, synchronization speed saw no dropping. Engineer told me some moist built up in the box, and it's all been fixed. Then the same issue happened again around end of November, except this time the line went completely dead, no dial tone. Naturally with no dial tone ADSL was down as well. An engineer was called out and fixed it promptly, he rang me on the previously dead land line, so I was convinced that it's fixed. A week or so later, 19th of December my ADSL had frequent disconnections, but I didn't noticed it till now. Then on the 23rd it wouldn't stay on line at all. ADSL signal would disconnect as soon as it's connected. 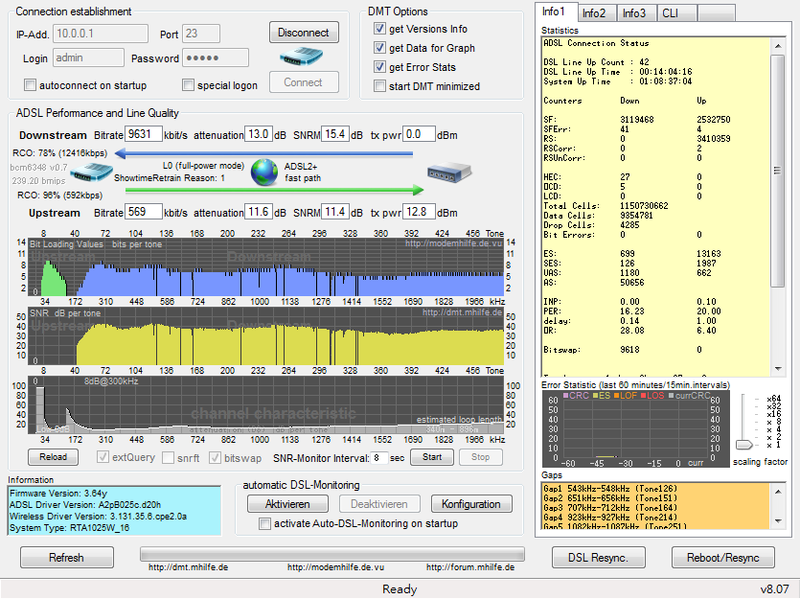 I managed to stay on line by connecting with G.DMT instead of ADSL2+ profile, later I found an utility to help me set the SNRM so rather than the usual 9db or so, by raising to 20 db I was able to stay on line with ADSL2+ profile at 9Mbps as shown here. Engineer arrives on the 26th and I saw my line stats vastly improved, whereas I had gaps before they disappeared almost entirely later in the afternoon however, I started seeing similar patterns again. I started having drop out albeit at lesser rate. 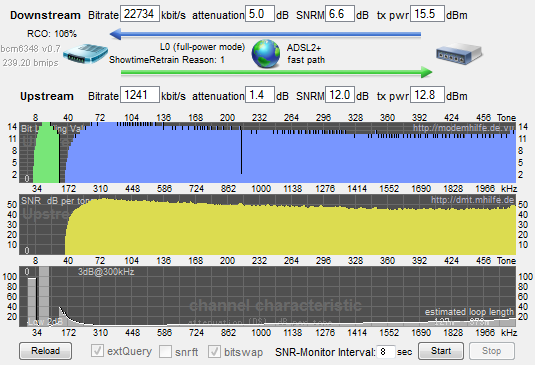 So once again I raise the SNRM to 12db so I am able to stay on line. So far, the quality of the line is decidely better than when it was broken, but not as good as before. The fact that it was fixed temporarily is genuinely bizarre. I rang Orcon again, and the helpdesk suggested to turn on interleaving to help me stay on line. To me if Chorus had been checking and fixing all those points outside of my house and the issue remains, then the only thing left is the wiring on my property, and I would like to have it checked out. But right now the help desk would rather leave it at turning on interleaving for me, as these call outs are costing Orcon a lot. 1. Is this common? As in, should I expect this to be fixed or is this the norm? 2. Would interleaving help with a noisy line? Sounds like you've had quite a few issues with your line, I wouldn't be at all surprised if we needed to book another technician to get out there and take a look. However you mention that the issue now is your Broadband disconnecting frequently? Turning interleaving on is definitely a good thing to try and solve this problem, so it may be worth it to wait and see what happens. If you still have problems, definitely give us a ring back and we can book another technician for you. Would you please confirm the date of interleaving turned on? I would love to have my lines checked out, but seeing you guys are the pros, so I'd try your suggestion first. I wouldn't know I'm sorry, I don't have any of your account details. Send me a PM with your username and I'll see whether it's been ordered or not. I have got a Linksys Router to rule out the old router issue. The phone was filled with statics again on the 14th of Jan. After I rang Orcon that night, the very next day (Sunday!) another Chorus engineer showed up, so very good service. I asked him what is wrong, and he told me that he'd need 20mins to an hour to fix the issue. So he went and tinkered away, rang me 30mins later and said it's fixed. I should have no more noise. Here's where the tale takes yet another strange turn. On the very same night it's supposedly fixed the line was cut off in the middle of the night around 11:40, completely dead. No dial tone nothing. Broadband was disconnecting frequently, but there was indeed enough signal for it to sync at around 6Mbps. But the next day in the morning it was good as usual. Orcon did very well rang me on the 16th asking me whether the line is fixed. Needless to say he's just as dumbfounded. And tonight, at around 10:30 the line went dead again. To me it sounds like your tie-pair is pritty screwed, see if orcon can order a tie-pair change. One small question from the road to your house do you have overhead wires? We get these little buggers sometimes even on other ISP's it takes persistence and sometimes good techs and your problem will be fixed. Nebbie: To me it sounds like your tie-pair is pritty screwed, see if orcon can order a tie-pair change. Don't have any overhead wires around here... got the persistence part right though, hopefully get a good tech this time round! Perhaps individual techs have their way of doing their work, as every time they find something to fix, and it's still not fixed. Phone line now goes dead from time to time, no dial tone and broadband no signal as well. Really bizarre. Perhaps a rat's chewed my cable somewhere.. Chorus just rang me, and said it's all fixed now, found a cable fault should be perfect now. Line was fixed last week, and is decidedly better. For the past 7 days, I have had around 10 disconnections. Though I used to have a rock solid line (single digits per month) this right now is good enough for me. Test thoroughly and be ready to backup what you say. Test your equipments and you can save Orcon some time. The only thing Orcon can do is determining whether if there's really a fault and send out a Chorus guy to fix the issue. It would be beneficial to have a process to obtain engineer reports, so if a repeating issue occurs you can handle the clients better by informing them. I have had around 5 visits in total, with one irate Orcon helpdesk supporter complaining how it's costing Orcon a lot of money. Surely I understand the sentiment, but others may not be as understanding. And of course after every visit the engineer assured me that the problem is fixed. Please have a better CRM system, almost every helpdesk support I spoke to have almost no idea what happened to me. The system is either slow or non-existent by the looks of things. Even a little flag for repeating issues would help immensely. It would be nice if you can report back to Orcon rather than the client(only?) after the line is supposedly fixed. In total this issue ran for almost 6 months, hopefully resolved indefinitely. Thanks bameron and Nebbie for taking your time reading through my issues, and as always freitasm for this platform. If the line is Telecom Wholesaled Chours talk to Telecom then relay that to Orcon, often all you would get back from Telecom is "Fixed". If the line is a Red Network Unbundled line then Chours would talk directly with Orcon, and they do give feedback as to what was done. What you would fix is that 5 Techs went on site and each tech did something different, sometimes you get these sort of "pain in A" issues, I belive these fix's often are the result of more then one issue on the line at the same time rather then just one problem. But as a customer my self and experienced a simpler issue you just want the problem resolved as a customer you dont care what the issue is or how broken it is you just want it to go away. Its good to hear that you stuck with it and what sounds like kept you cool and the problem was resolved, I've once been on the helpdesk end of these problems and the abuse you can get is outstanding. Hi there - great to hear that it's all sorted now, I'll pass your comments on to the team! Back to rock solid line now :) Thanks Cam.